On August 6, 2011, journalists in the West African country of Togo rallied in the streets of capital Lomé  [fr] to protest against the threats that their colleagues received recently. The rally was launched on August 3, by the association ‘SOS Journalistes en Danger’ (SOS Journalists in Danger). ..aimed at physically harming the journalists, specifically via faked accidents, poisoning and made-up stories. According to leaders of the association, the threats were later confirmed by an anonymous letter, presumably written by an agent of the ANR and addressed to the journalists who already were targeted on July 21. The rally was supported by human rights advocacy group, unions, some political parties and various local newpapers. In a joint statement, the UJIT (Union of Independent Journalists of Togo), the CONAPP (National Council of Press Writers) and the OTM (Togolese Media Observatory) have called upon CNDH, the National Comission for Human Rights, to open an investigation on the matter and encourage their threatened colleagues to go to court so that light can be shed on the issue. – The President of the CNDH, the Minister of the Communication ( for a second time) the Minister of the Human Rights, Democracy Consolidation, and Civil Formation and the Director of Communication for the Office of the President of Togo. The objective of the rally was to denounce the clear abuse against the freedom of press. 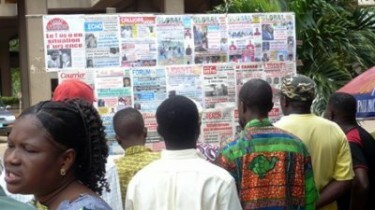 They intend to organize more rallies in the coming days to ensure the protection of free press in Togo. In addition to this issue, the ANR has been implicated in a wave of other human rights violations.